I’m sure if I counted, a large portion of the recipes on this blog would be breakfast ones. I think it’s probably my favourite meal of the day, it can be as quick and simple as a bowl of porridge or as leisurely and indulgent as time allows. Mid week I lean towards the quick ones but at the weekends I like to chill out with a nice cup of coffee, something to read and a tasty breakfast. 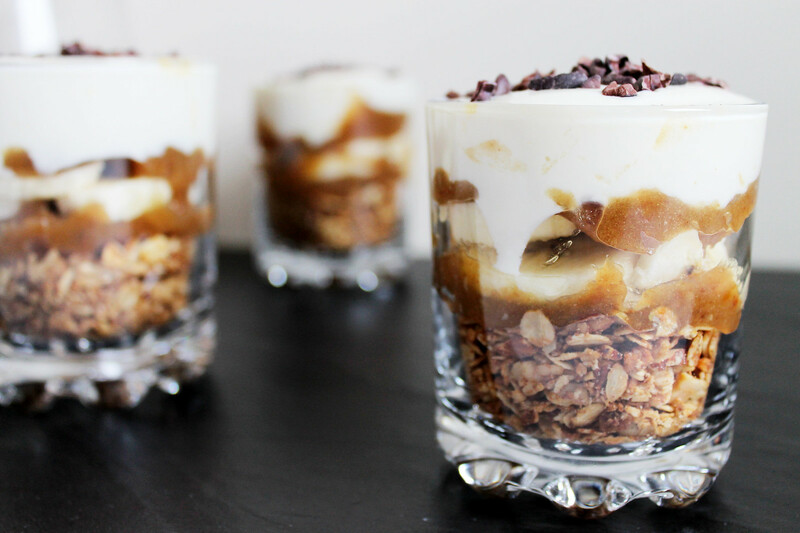 These banoffee breakfast pots tick the indulgent box taste wise but are a pretty healthy option all the same. Based on my favourite ever dessert (both to make and to eat!) there’s enough sweetness from the dates and banana to taste great while the oats, nuts and yoghurt mean that this is pretty much the best breakfast ever. 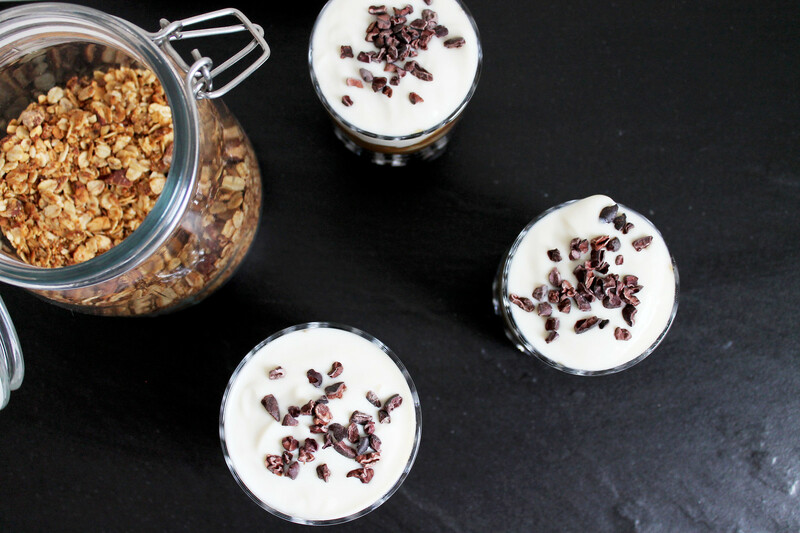 The cacao nibs are optional but what’s a banoffee without a sprinkling of chocolate? You can make the individual components at any time so you have them on hand to throw together quickly. 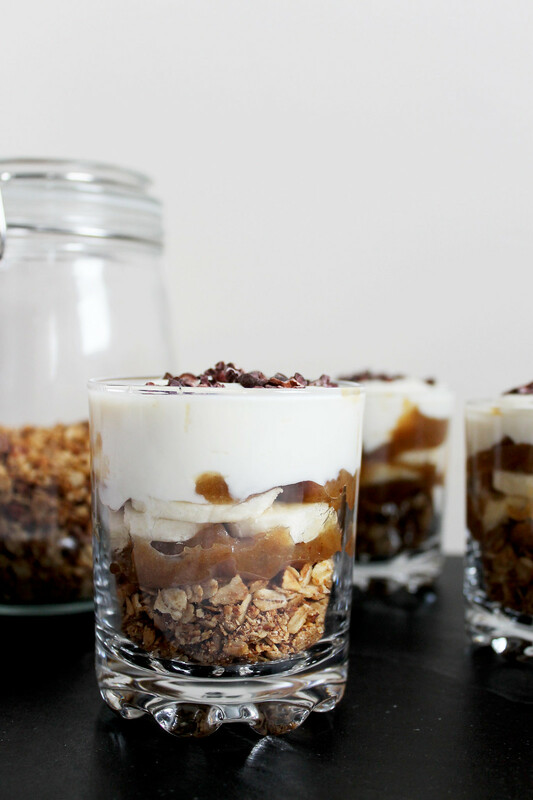 This recipe will serve 4 with a little of the toasted oats and nuts left over to use throughout the week, they’ll keep in an airtight container for up to 7 days. The date paste should be good for 3-4 days also, store in the fridge. It tastes amazing dolloped on regular porridge. Now if you’re looking to make this more dessert like, layer up the ingredients the same but replace the yoghurt with a mixture of cream cheese, greek yoghurt, sugar and vanilla extract (see this healthy cheese cake recipe as an example) and top with shavings of dark chocolate. Not a dairy free option obviously and not as good as a real banoffee but pretty delicious! Preheat your oven to 180C(fan). In an ovenproof glass dish, add 2 cups of oats and 1 cup of chopped almonds. Gently melt the coconut oil and honey together and pour over the oats and nuts, stirring until they are coated. Pop in the oven for 30-40 minutes, giving them a stir every 10 mins or so, until they are nicely toasted and golden brown. Meanwhile soak your dates in the boiling water for about 30 minutes until they are softened. I use Delget Nour dates usually, if you have Medjool you won’t need to soak them for too long. When they are nicely softened add the dates and about half of the soaking water into a food processor and process them until they are a caramel coloured paste. Add a pinch of sea salt to taste. When your oat mix has cooled add 3-4 heaped tablespoons to the bottom of a serving glass or jam jar. Spoon over a tablespoon of date paste, half a chopped banana, another tablespoon of date paste and top with yoghurt. Sprinkle some cacao nibs on top and dig in! This looks so incredibly delicious, Rosie! 🙂 I love how healthy the recipe is! Breakfast couldn’t get better!